For information on attractions and activities at Bushnell Park, visit them online. While this oil painted portrait (1899) is not currently on public display at the museum, it is interesting to note that it was created about 50 years after Horace Wells’ death. Renowned Hartford artist Charles Nöel Flagg reportedly modeled the life-sized portrait (which measures 57” x 43”) after a daguerreotype and full-length silhouette of Wells, both of which were reputed to have been created by Wells himself. 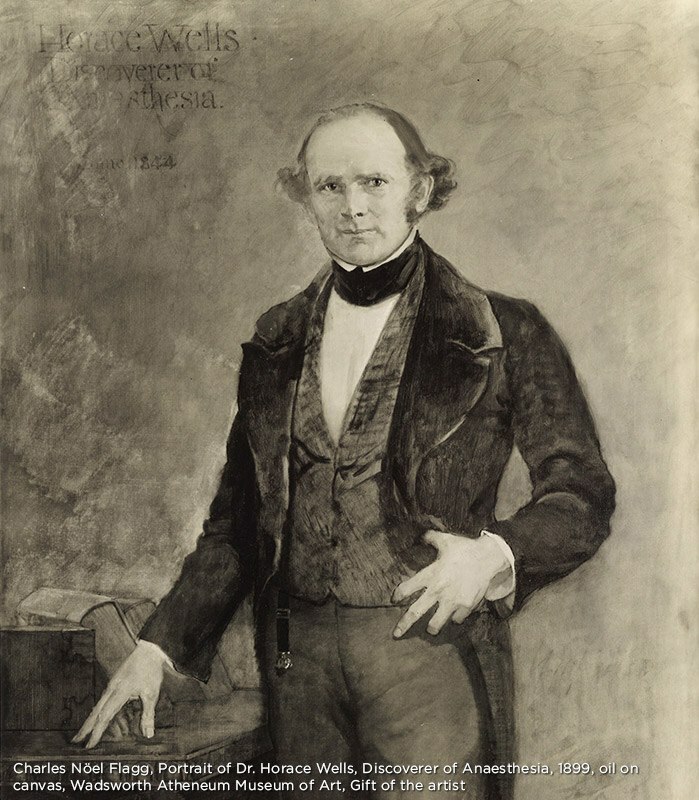 In his lifetime, Flagg painted 150 portraits of notable Connecticut individuals, including Mark Twain, James Wales Ball, Gideon Wells, Brigadier General Joseph Warren Revere (a descendent of Paul Revere), and Charles Dudley Warner. As soon as you enter the Trinity College Chapel, you are greeted with row upon row of elaborately carved oak pew ends. There are pews dedicated to Hartford notables, including Israel Putnam, former Trinity College President Remsen Ogilby, private family memorials, and other persons and events of historical importance. 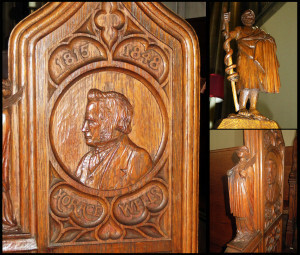 The Horace Wells pew end was presented to the college by Dr. Frederick T. Murlless, Jr., President of the Horace Wells Club and a founder of the Newington Home for Crippled Children (which later became Newington Children’s Hospital) and unveiled at Trinity College Chapel in 1937. Connecticut woodcarver J.G. Wiggins crafted the pew in a Gothic architectural style, which depicts an encircled profile of Wells, with his birth and death dates appearing on top of the border. The three-dimensional carved finial gracing the top of the panel depicts the Roman God of medicine and healing, Aesculapius, who bears a staff in his right hand and a cloak draped over his right arm. The figure on the arm rest is the patron saint of dentistry – St. Apollonia (who was boiled in oil and suffered the removal of all her teeth). She holds the palm of martyrdom in one hand and a pair of forceps in the other. The chapel is open most days to visitors from 9 a.m. to 5 p.m. Contact Trinity Church Chapel for more information. 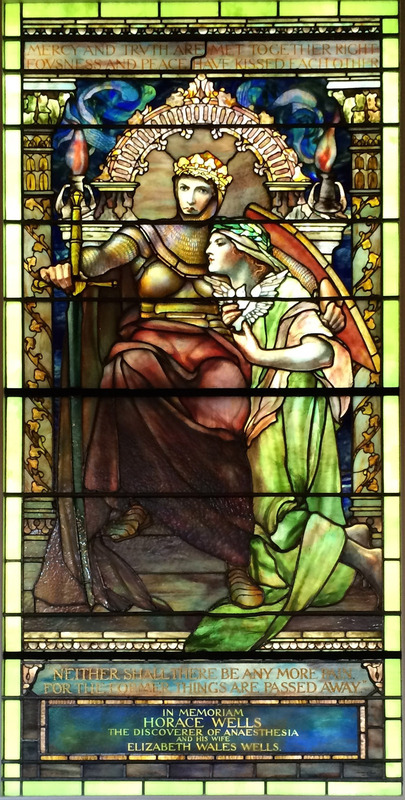 The Horace Wells Memorial Window at First Church of Christ (Center Church), also known as “Righteousness and Peace,” was created by Tiffany Studios in 1903. The window was commissioned by Charles T. Wells, the only son of Horace and Elizabeth Wells, who were parishioners of the church. The phrase “Mercy and truth are met together righteousness and peace have kissed each other” appear across the entire top portion of the stained glass window. 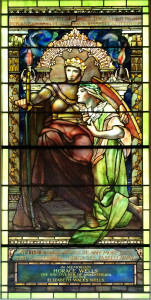 The inscription at the bottom of the window image reads “Neither shall there be any more pain for the former things are passed away.” The base of the window bears the official dedication: “In memoriam Horace Wells the Discoverer of Anesthesia and his wife Elizabeth Wales Wells.” The Tiffany window – comprised of several layers of glass, which provides a textural three-dimensional feel – was restored by the Church in 2002. The image depicts a medieval-style crowned figure seated on a throne, with a kneeling figure to the side holding a dove. 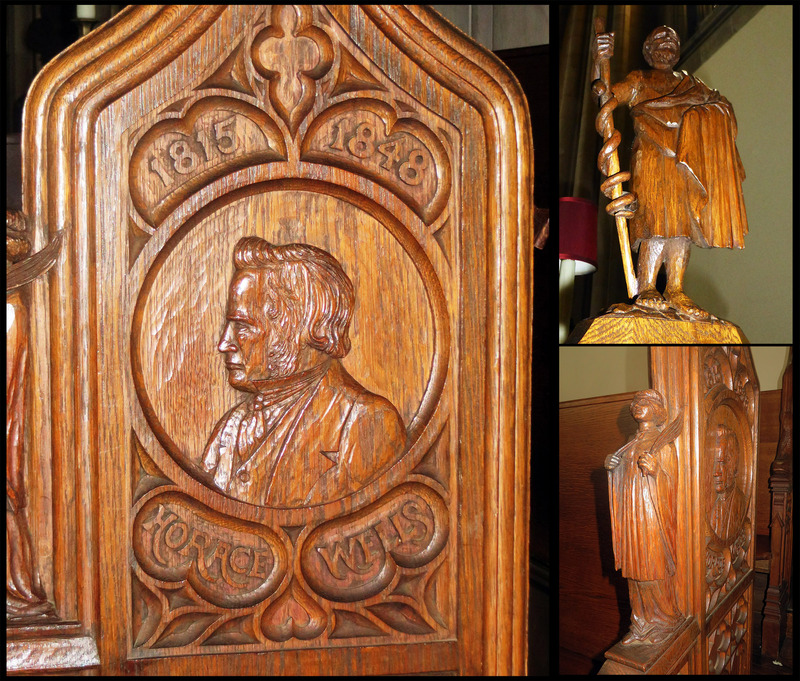 Dr. Wells is represented as the seated figure with symbolic emblems of righteousness, salvation, and mercy. Wells’ wife, Elizabeth, is represented as the kneeling figure with symbolic emblems of truth, dedication and love. The Church will be open from 12 p.m. to 2 p.m. September 17 and 24 and October 1. An informal presentation on Horace Wells will be held from 12:15 p.m. to 12:45 p.m. and guides will be available to answer questions. The Church will be open on Saturday, September 20 for Envisionfest (http://envisionfesthartford.com) from 10 a.m. to 12 p.m., where guides will be available to answer questions. An informal presentation on Horace Wells will also be held at the church on Sunday, September 21 from 12 p.m. to 1 pm. All events are free. For groups of five or more, please call 860-249-5631 to make an appointment. Metered parking is available on Gold Street. Hartford’s old North Burying Ground was the original site of Horace Wells’ grave. Wells’ son chose to move the family burial plot to Cedar Hill Cemetery in 1908. 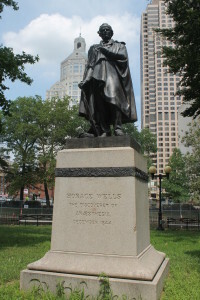 Horace Wells now resides alongside other Hartford notables including actress Katharine Hepburn, Poet Wallace Stevens, Samuel Colt, and John Pierpont Morgan. Sculptor Louis Porter was commissioned by Wells’ son to design the bronze relief tablets on the monument. The relief on the face of the monument shows an angel suspended in mid-air, arms extended, and hands moving toward a reclining man. Beneath this image reads the phrase “There shall be no pain.” Carved into the back of the stone memorial is the dedication “Horace Wells, 1815-1848, Discoverer of Anesthesia.” On either end of the monument are intricately designed pictorial reliefs which symbolically describe the effects of anesthesia. 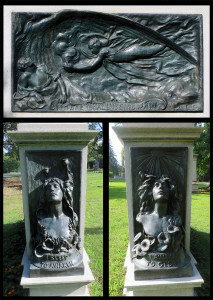 The right relief, featuring a woman surrounded by stars and poppies as symbols of sleep, is inscribed with the phrase, “I sleep to awaken.” The left relief, featuring a woman surrounded by sun radiating rays onto a vine of morning glories as symbols of alertness, is inscribed with the phrase, “I awaken to glory.” In front of the monument lie three grave markers for Horace, Elizabeth and Charles Wells. Cedar Hill Cemetery will be celebrating its 150th anniversary this fall. 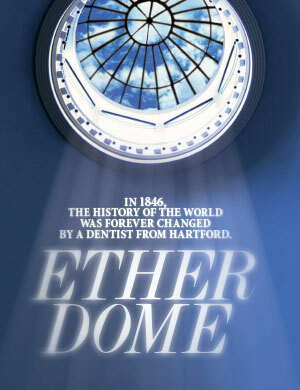 “Beyond the Gates: Cedar Hill Cemetery Celebrates 150 Years,” a Victorian-themed event featuring costumed dramatizations and musical performances, will be held on Saturday, September 13, 2014 from 10:00 a.m. to 5 p.m. For more information, visit Cedar Hill Cemetery or call 860-956-3311.